Under normal circumstances, an accoutrement or garment used by a traditional black powder hunter should acquire honest wear and tear under actual field conditions, rather than be “artificially aged” to look like a museum exhibit that is two-hundred-plus years old. But, under certain circumstances, such as the creation of a new and different persona, the judicious application of wear and tear may be permissible. 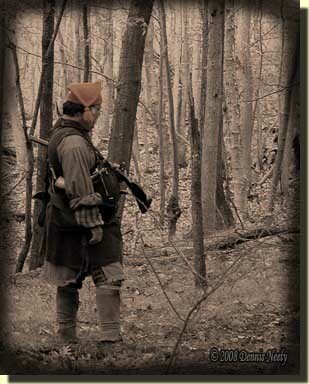 Traditional woodsman Fred Tonks portrays a British hunter out of Fort Detroit. If the traditional woodsman’s goal is a fair and truthful portrayal, then at any point in time, a living historian’s wardrobe should reflect a “progression of age and use.” By that I mean the age and condition of the garments and accoutrements should span from newly-acquired to thread-bare and ready to be discarded. After all, the fur-trade ledgers show individuals purchasing one or two replacement items, not an entire ensemble, but there are always exceptions. For me, the notion of a progression of age and use developed slowly over the decades. By observing the wear and tear inflicted on the various articles of clothing by a season’s worth of history-based hunts, I came to realize trail-wear was not uniform, rather capricious and a tad garment specific. Blood or mud splatters stain where they land. Sharp-barbed brambles slash and rip from head to toe. Medium-weight linen gives way before buckskin. Fresh moccasins show age first, along with leggins, while a calico trade shirt, covered over by a weskit and a linen hunting shirt, remains trading-post new for quite a bit longer. “When I came into the settlement, my clothes were almost worn out…I had not traveled far after I came in before I was strictly examined by the inhabitants. I told them the truth, and where I came from, &c. but my story appeared so strange to them, that they did not believe me…on suspicion they took me into custody, and set a guard over me. Upon deciding to re-create a returned native captive persona, I found myself with a bit of a dilemma: do I start at once, cherry-picking the best clothing and accoutrements from the living history closet that come close to what a native captive who returned to the settlements might own, replacing items as I progressed, or should I wait to begin until an historically correct wardrobe was gathered? The first choice won out; little time passed before the new historical me stalked the wild turkey and pursued the white-tailed deer. By the close of the first hunting season, I had added a handsome ruffled trade shirt, a reworked bison powder horn, a simple wool breechclout, repurposed trade-blanket leggins and buckskin leggin ties patterned after existing museum originals. In the late 1970s, when I first stepped onto the path to yesteryear, I gave no thought to the progression of age and use as it applied to my character’s impression and how that impression of the past was viewed by others. As my traditional hunting sojourns piled up and the modern hunting seasons came and went, I slowly came to the realization that in those early years all of my alter ego’s material possessions were “almost new”—a hidden pitfall of not properly understanding the principle of maintaining a reasonable progression of age and use. In 20th-century terms, my kit possessed a progression of age, purchased or made over a period of two to three years, but in the context of 18th-century days, it was all new. In my exuberance, I failed to do some simple math, to view my portrayal from the perspective of my hunter hero’s daily lifestyle and time frame. And from Doddridge’s recollections, the “rest of the week” for a hunter might be six days, perhaps twelve hours a day, or 72 hours afield. And since they did not go naked in camp, the woodsman’s basic clothing—trade shirt, breechclout, leggins and moccasins—racked up hours of wear and tear, in some instances “24/7,” expressed in modern lingo, for a total of 168 hours per week. When the clouds evaporated from in front of my eyes, I kept careful records of how many hours I spent time traveling. In those early years, that included a sizable portion of the two weeks of Michigan’s firearms deer season and about ten evenings with one, maybe two, full Saturdays during the December muzzleloading season. Yet, even with that commitment to traditional black powder hunting, I was hard pressed to come up with 168 hours, the equivalent of a full week’s worth of wear and tear measured in 18th-century days. 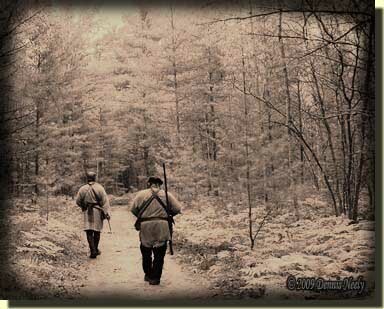 John Booy (left) and Charles Brown (right) follow a foot trail through the forest as they returned to their camp at Marl Lake in the Old Northwest Territory. The deer-season-equals-a-week ratio had the same impact as dropping through the ice on a January morning. I suddenly viewed my wardrobe and accessories in a different light. I became more observant of the subtle patina a mud splatter left or how a Rose of Sharon thorn pulled a linen thread. When the bark of an old hickory tree cut a sinew strand and scattered red beads on yellow leaves, I took note, patching the mishap in a manner consistent with an edge-beaded deerskin pouch I had seen in a museum exhibit. As two decades passed the progression of age and use took on what I believe is a closer resemblance to the clothing of my hunter heroes. I patched more and continued to use garments and accoutrements beyond the point where I might have replaced them back in the 1980s. But the problem that faces me now is starting over with a different persona and the question that I find myself wrestling with is how do I re-create an honest progression of age and use with a wardrobe that is new, measured in 18th-century days?